My fiancé and I just returned from our vacation to Excellence El Carmen in Punta Cana, Dominican Republic. We went to their Excellence Cancun location in September for my birthday, so we decided to go to their Excellence El Carmen for my fiancé’s birthday. Let me just cut to the chase, El Carmen was a underwhelming compared to Cancun because management at El Carmen and food quality were not nearly as good as Cancun. 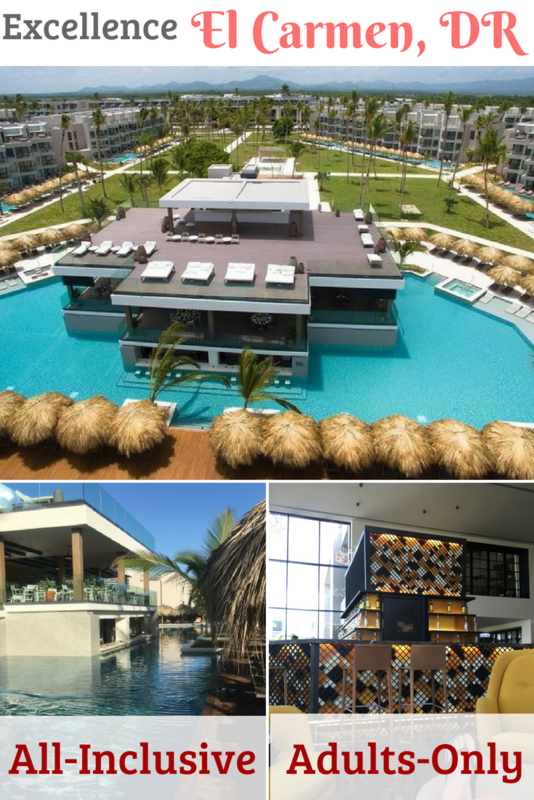 Why do we feel like Excellence El Carmen does not have the same level of service as Cancun? I have plenty of information below (and a youtube video here). After my original review a few things changed. Orilin (from guest services, sorry if I spelled your name wrong!) 2 days after my original review she and someone from concierge called the room (and I assume they called the next day but I didn’t answer bc I didn’t know who was calling) and they both asked if everything was ok. Guest services specifically mentioned my review and apologized a lot, she said they were investigating why the ball was dropped. She also made us a reservation in Magna (club restaurant) to make up for the issues. I let her know we are looking at Excellence El Carmen AND Secrets Cap Cana for our wedding just to be fair and clear with her. Dinner at Magna was one of the top 3 dinners we had. The food was delicious and they had balloons at the table for my fiancé’s birthday and sang to him etc. There were also a ton of surprise drinks and desserts being sent to the room every night along with balloons at dinner every night. My fiancé and I decided to do the hydrotherapy circuit at the spa which was an hour long and $40 per person. We highly recommend it! You are guided to a locker room to change into flip flops (so you don’t slip) and wear your bathing suit, then into the sauna for 5-10 minutes (we opted for 10). Then a series of hot and cold water things (the employee tells you what everything is for). Then into a steam room with your own dish of exfoliation stuff and a cold face towel for 7 minutes. Afterwards, you walk on stones with water spraying at your calves to massage them, then on to do the cold/hot water circuits in the pools! Then bubbles in another pool and water massages in the pool from fountains for your neck/shoulders and back. After all that you are covered in a towel and brought to lay on a warm stone lounger and they cover you with your towel and a cool towel on your eyes and they massage your neck, shoulders, and head with the most delicious smelling lotions and sprays. Again – definitely worth it! Spice, their asian restaurant, just skip it if you like sushi. The salmon and tuna sashimi were FROZEN when they were brought out to our table. The sushi is super basic – so if you’re sushi enthusiasts like us, pass. Spice in Excellence Cancun is way better. More sushi options, mind-blowing soy sauce (sounds crazy, but I’m serious)! I did tell the waitress about the frozen sashimi and she apologized. Basmati, their Indian restaurant, is one of the best options here (and Cancun)! We ate here twice because it was so good. It’s the most flavorful restaurant, the portions are spot on – order rice, and naan because the rice is about 1-1.5 cups cooked and the naan is only 1 piece split in half. I was afraid we were ordering too much because we ordered 3 appetizers (fries onion, fried squid, and chicken samosa – all small portions but delicious), plus saffron rice, garlic naan, and our entrees. We left feeling full (not grossly stuffed), and had dessert! Desserts we tried were fried bread with honey and the last item on the left page of the menu (it was pretty much a dense donut hole swimming in syrup). Good stuff, but not mind blowing. Differences in comparison to Cancun? Portion sizes are bigger in Cancun, but the flavors are consistent and delicious in both locations. restaurants, is a must try. This (and Basmati) were our favorites in El Carmen AND Cancun!! This is a small plates/tapas restaurant. Everything is delicious, the fries here are freshly cut and fried – not the frozen stuff. Meat plate with chorizo and other meats are amazing. Also the garlic soup and gazpacho – all of it was delicious. Desserts didn’t “wow” us like they did in Cancun, but still our favorite in both locations. Sports bar – Mozzarella sticks (cheese fingers lol) are delicious in both locations! I’d say the onion rings in El Carmen taste like Burger King onion rings, just different batter. Cancun onion rings were delicious. The wings are frozen for too long because the bone is a dark red color (which indicates frozen). We asked for spicy (and I’m Cuban and fully fluent in Spanish) but they came out plain and the female waiter never came back. They also didn’t come with blue cheese. We also had an Italian pizza, but they didn’t put the balsamic glaze on it like it was supposed to have. Someone dropped the ball in the kitchen, and the waitress was just complaining the whole time assuming nobody spoke Spanish – but I do. On the positive side, the bartender (not Felix – I didn’t see when we were there) was hilarious and always having a good time. You could tell he didn’t let that complaining girl get to him, he did his job and hers. Martini bar – delicious. Open from 9am until midnight I believe. Those bartenders are on their game every day/night. None of the bartenders disappoint with their drinks! I usually ordered an espresso martini or another martini. X-Lounge – very calm and relaxing as long as no drunkies are up there. First night the bartender was a young guy and taking shots with a group of people. They called him Pedro, but I didn’t check his name tag. The next nights it was an older, heavy bartender and he was not as outgoing but he was a great mixologist. He made me special drinks and put his own spin on things if you let him. I enjoyed our time up there! Las olas – it’s a beach lunch place. You can wear your wet bathing suits without cover ups or shoes. The guys cooking have more of a language barrier but they are the sweetest! The pizzas there are the best, too! Blue (bar inside the main pool) – some young skinny guy made mojitos in there for us and GROSS! It was all lime juice, soda water, and wilted mint. No alcohol and no sugar. We actually couldn’t drink them after 2 sips. We ended up never getting in the pool after that because service at the beach was AWESOME! Kitchen Table (buffet): We only ate here for breakfast and the omelette stations are delicious and the donuts and muffins! I also LOVE the Dominican corner (back left corner) – you have to try it! Towels: if you need towels after 3/4pm good luck. They start getting really sparse. To be fair, some people take 2 towels each or more so there is only so much that can be done to keep up with it. Room cleaning: the first 2 days our room was cleaned before 2pm but the next few days our room wasn’t cleaned by 5pm! We had to call and request for it to be cleaned. The next mornings we had follow-up calls to confirm the room was cleaned. My tip: Call and let concierge know the times you want your cleaning done daily so it is done every day at the same time. Luggage Pickup for Departure: someone (Jason?) called and confirmed our luggage pick up for 12:45 since our private transport to the airport was at 1:10. Then later that night another person called from concierge and said someone would come at 12:30. I called in the morning and asked for someone to come at 12 since that is the checkout time, but nobody ever came. So my fiancé and I rolled our luggages out by ourselves – ball dropped. Orilin (guest services lady) came by while we were in the lobby looking for us and asked how everything went and about my previous review and I told her I’d be updating it. It was sweet of her to come find us – it made me feel like she really cared. Our private transfer with Amstar was late by over 20-30 minutes, and we were told we couldn’t go with a different driver (so 2 amstar drivers left the resort with EMPTY vans to go to the airport.. annoying – but that has NOTHING to do with Excellence). We were still going through immigration when our flight was boarding and had to RUN through the airport – book private/any transfers through Excellence!! They keep their cars on site! Room: We were in room 1128 terrance suite with plunge pool. Love the privacy of the jungle view, but a few days there was a burning rubber type of smell (see pictures where there is smoke/cloudy). It was the last 2 days and we heard the construction going on below, but we loved the room. Overall we are torn. The wedding coordinator showed us our wedding options and the price is right, but we are afraid of the ball being dropped like the first 3 days we were there. It is a beautiful and perfectly designed resort, but management drops the ball SO much, BUT the service workers are PHENOMENAL! Especially Alminton! He was more enthusiastic about wedding planning than anybody else! We definitely preferred the service and quality of food at Excellence Cancun/Riviera Maya, but we 110% prefer the layout/design of Excellence El Carmen. Except Cancun has larger pools, but if you’re more of a beach or swim-up suite person, you’d probably prefer El Carmen. The bathroom is an open concept, which we love, with double sinks and mirrors as seen to the right. This was the in-room alcohol. Johnny Walker Red Label, Ron Barcelo (Dominican Rum), and an unknown vodka. There was also Presidente, Dominican beer, soda, water, tea, coffees, juice, and more. The view from the room and design were beautiful. We loved the hot tub in the room, but it was completely enclosed by glass, so you could enjoy the view. We opted to tilt the second TV towards the sliding door so we could watch tv through the glass while we were in the tub. Please pin this to Pinterest if you don’t mind!